Need more information about booking Home 7264089 ? Popular with couples and families, the condominium offers all the privacy and security of the apartment, whilst having excellent staff to assist you during your stay. Each apartment is fully serviced and comes with WiFi coverage and cable TV. The complex is set in luscious tropical gardens, has 4 swimming pools and a fully equipped fitness center. The tour desk is loaded with all the exciting events, tours and shows that are happening throughout the year and also offers car and motorcycle hire. 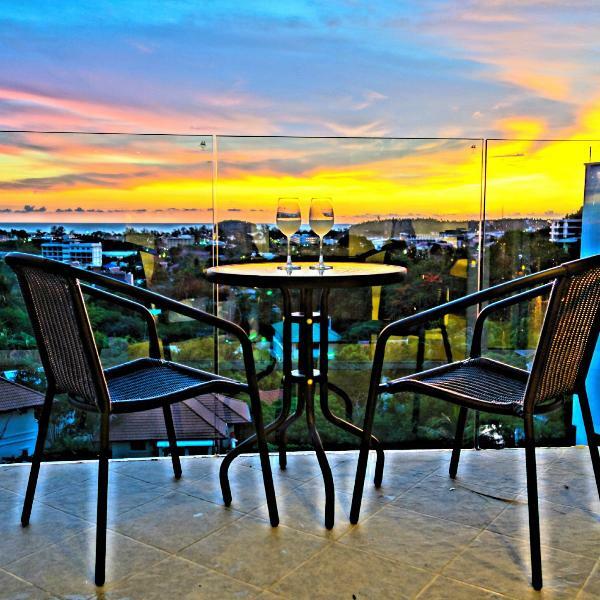 The condominium is a leader in the area for vacationers from Thailand, Australia, China, Russia, throughout Europe and Southeast Asia, and Worldwide. The golf vacation package, yoga retreat, and other amenities provide plenty of options for visitors and vacationers staying on Phuket Island. Even if I have indicated check in/ out time, I am pretty flexible on this point, depending if I have other guests coming or leaving the same day. In that case I have to be more strict because I need to ensure the cleaning between the two guests. The front desk is open from 8am to 8pm, from Monday to Sathurday, and from 8pm to 6pm on the Sunday. If you need a check it/out after or before office hours, a presence can be organised at the welcome desk for a small fee that will be paid directly to the condominium. As explained, the appartment is located in a complex offering different facilities. Even if some of them are included in the renting fee, the condominium will take a credit card copy during the check in as deposit for the usage of the commons, not belonging directly to the appartment. In case you don't have credit card, 10 000THB cash will be requested. You can get in touch with Franck (the owner) through the contact form on this page. Send Franck (the owner) an email through the contact form on this page. Alternatively, if there’s a phone number on this page, you can call them. How do I contact Franck (the owner)? If you’ve already booked, go to Manage your holiday booking to view Franck the owner's contact details or send them a message. Or send Franck (the owner) an enquiry through the Contact the owner/manager form if you’d like a quote or more info first. When you pay online through the Book your stay form, a booking request is sent to Franck (the owner). You’ll find out within 24 hours whether they’ve accepted - no money will leave your account before then. You can also request a quote from Franck (the owner) through the contact form. The owner will email you the total cost for your dates and a link to book and pay online. Use the Book your stay form to pay provisionally online. You can pay by credit/debit card or PayPal. Franck (the owner) will have 24 hours to accept the booking and no money will leave your account before then. Why can't I call Franck (the owner) before booking? You’ll need to contact Franck (the owner) to do this. Send them a message in Manage your holiday booking or through the contact form on this page. You can request to change the dates or number of people on your booking via the Manage your holiday booking page. To change your holiday dates use the Edit booking button. If you need to change the number of guests staying then send Franck (the owner) a message. If Franck (the owner) agrees, they’ll send you a revised quote outlining the changes. You can review and accept/decline this from the Manage your holiday booking page. You’ll have 48 hours to take action before the revised quote expires.